Are We There Yet?? : Woohoo and Whoops! This has been a Friday that has most definitely had its good and bad parts. It was good in that it was the last day of five in a row at work and after putting in a little over 56 hours this week, I can now look forward to two glorious days off before I do it all over again next week. That's a 'woohoo'! It was also good in that I found out that the zombie photo of Amanda that I had entered into the Halloween Costume Photo Contest on Facebook that the Rockport Inn & Suites was holding was the winner and we're now the proud awardees of a free night at a fantastic-sounding place! I've looked at the Rockport Inn as a potential place to stay several times as it's not too far from Amanda's college plus it's in the Cape Ann section of Massachusetts where there are plenty of picture-taking opportunities. Can you say scenic seaside scenery? I can! A very big thank you again to all those who voted and "liked" Amanda's picture. 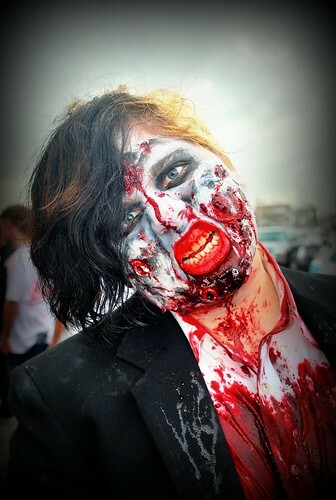 You've got to admit that she makes for one fantastic zombie and I bet the trip will make for one fantastic blog post! Definitely a 'woohoo' on this one! On the flip side, things got kind of bad when I got home from work and found I had a letter waiting for me from the Office of Child Support Enforcement in Tampa, Florida telling me that I owed past-due child support for Jamie. Sigh ... not again! I called the number they listed, waited on hold for close to half an hour, and finally got to talk with someone who told me that they hadn't received anything from the State of Connecticut invalidating their claim. So ... I hung up, called the Office of Support Enforcement here in Norwich and got the same rude lady that I spoke to shortly after our court appearance when I had called to make sure that they knew there were no more past-due or future orders for support. When I finally explained to her that I wasn't a dead-beat parent (I get the feeling she immediately adopts that tone when she finds out she's talking to the "guilty" party in a support enforcement case), she told me that a notice had been mailed to Florida on October 27th but they couldn't be responsible for the U.S. Postal Service. Yea, toots, no kidding! So, even though I thought this was finally all behind me it looks like I need to fax some forms and what-not next week to finally remove the last of the albatross that's been hanging around my neck. This one gets a big 'whoops'. Due to my crazy work schedule I hadn't had a chance to open the box until this afternoon and I when I did what did I find inside but someone else's computer? Not even a better MacBook, mind you, but a smaller model that had obviously seen much better days. WHAT?? With a sticker with someone else's name on it, too! I immediately called my warranty provider who gave me the number to the repair facility so that I could talk to them directly. The guy that answered the phone sounded like he'd been hitting a bong pretty hard and after making a futile attempt to try to explain the situation to him, he finally put me on the phone with his manager - oh thank goodness! Turns out that somehow the shipping label with Amanda's computer and the other kid's computer got switched before shipping and Amanda's computer took a trip to Columbus, Mississippi while I had the other kid's computer sitting on my dining room table. Bryan, the manager, was very apologetic and immediately emailed me a pre-paid UPS Next-Day-Air shipping label so that I could send the computer I had down to Mississippi while he got in touch with the people who had Amanda's computer and did the same for them. Luckily her computer ended up at a college prep school called the Heritage Academy and the kid that it belonged to was on the Tech Team - whatever the heck that is! - so it was easy to track hers down. I packed everything up, attached the shipping label, and dropped it off at the closest UPS shipping station at the local Staples so it should get to its proper owner soon. In the meantime, Bryan emailed me the tracking number for Amanda's computer so hopefully it will be on its way north soon. Absolutely a big 'whoops' on that one, too! So - the good and the bad are all balanced out now and I sure hope that's it for the day - I've only got to squeak through a little over another four hours so I should be safe, right?? congratulations on the winning photo. Sorry your really good day had a bad course of some events though. Hope your weekend is good. 'hitting a bong pretty hard'... that pretty much sums it up, doesn't it?! hahahaha! OMGoodness...so much *stuff* can just go wrong, but glad it is working out. Sheesh. You need some time off! Duchess, Duchess, Duchess. What a rollercoaster day you endured. All I could think of when reading this was "you have to take the bitter with the better" or something profound like that. It's a new day. Hope it's quiet for you. When You have a WEEK, you really have a WEEK. Maybe you could change "Are We There Yet" to "My Life On The Roller Coaster". Hope all the Whoops and downers get safely on the upside. Good to know the blog's resident zombie came through a winner! Sorry to hear about the unfortunate happenings. Things don't happen to you in half measures do they Linda? Phew!! Congratulations of the win. Way cool. Yikes on the child support thing. Just when you think it's over it's not. I hope that paperwork finds it way to Florida very soon. Wow on the computer mix up. That's quite a tale of things going wrong. Glad you got it sorted out. I feel bad about it, but I did hang up on a help desk person today. We had so much trouble getting our wireless router situation squared away. I called tech support on the first new one we bought, and she said the SN wasn't "correct". Long story short, she said they couldn't help me with the wrong SN, but I could pay for service...on a brand new router I just purchased. So I told her that was outrageous and hung up. Columbus, MS? That's where Mabel is (until the 18th). You'd love that town. Seriously. Lots of history there. Beautiful pre-civil war construction, a beautiful college campus, and some great eats.